Standard ECOTEC® 1.8L I-4 engine with 5-speed manual transmission delivers 138 horsepower and 125 lb.-ft. of torque in the base model. The available 1.4L turbocharged engine and 6-speed manual transmission offer an EPA-estimated 40 MPG highway without sacrificing power or athleticism. Sonic is a sporty, small car for those who want more than just a way to get around. It’s for people who love to have a little fun behind the wheel thanks to the available turbocharged engine that offers an EPA-estimated 40 MPG highway. In fact, Sonic has quite a history when it comes to safety. The 2015 Sonic was named a 2015 Top Safety Pick in its Small Car segment by The Insurance Institute of Highway Safety (IIHS). Plus it’s the first car in its class† to offer 10 standard air bags. 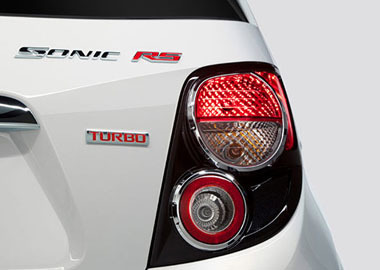 With Sonic RS, you can expect nothing less than pure turbocharged fun. 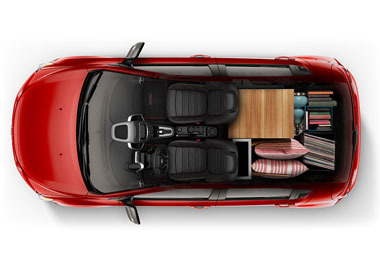 Sonic hatchback offers seating for five with 19 cubic feet of cargo space — 47.7 cubic feet with rear seats down. Sonic offers available built-in 4G LTE Wi-Fi connectivity through OnStar®. The powerful signal gives you and your passengers the ability to connect up to seven devices to the Internet, giving you the freedom to roam while connected. The OnStar Basic Plan keeps you connected for five years. Sonic offers available innovative safety technology such as Forward Collision Alert, Lane Departure Warning and available rear vision camera. Sonic offers the Advanced Safety Package to help you avoid a collision. It’s also the first car in its class to offer 10 standard air bags.